This is probably as far as I’m going to get with my Alex Rodriguez 2007 Bowman Chrome Rainbow. The 1/1 Superfractor has already been pulled and sold on eBay, so it’s probably tucked away in someone else’s rainbow for all eternity. This actually only took me about 2 months to finish, which was a lot less time than I thought it would. If you want to see some box breaks with a twist, check out the Burger King’s box breaks. This guy busts box after box of high-end stuff and gets completely shafted every time, but he has a good sense of humor about it (with some naughty language). Recently he put up a signed photo of himself on eBay to ease the pain of his latest Exquisite Box Break and it sold for $25!!!! I guess this guy has a real following of sympathetic viewers. It’s even numbered 1/1. Anyways, check out his vids for a good laugh and if you are feeling sorry for him paypal him some spare change. You know the drill. Here’s the 07-08 UD Black Basketball Video Box Breaks on youtube. List will be updated every so often. I must say, I feel the urge to go out and get one of these boxes even though I got burned by UD Black Baseball. The Basketball version looks slightly better, even though its still loaded with no-name rookies and semi-scrubs. Why must you be so ugly? I collect high-end Brian Leonard Cards, but there is no way I would pay anything near the $549.99 BIN price for this card. The NFL Shield Patch and Laundry Tag are squished into the smallest possible window and the picture of Leonard makes him look like a some sort of chicken-legged dwarf. Needless to say, I’m not a fan of the card design for this set. Seems like a waste of an NFL Shield to me. Check out Beckett’s 2007 Exquisite Football Box Break. They bust two boxes and pull basically the two nicest cards in the entire checklist. 2007 UD Exquisite Football Break from Beckett Media LP on Vimeo. 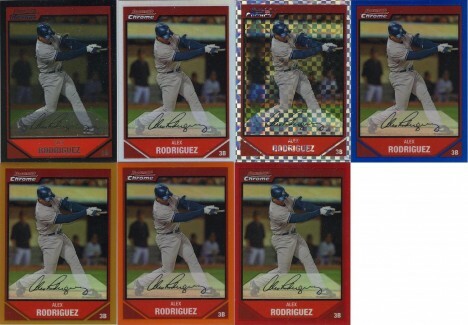 Now Topps is also guilty of sending loaded boxes to Beckett to open on their box breaks. A while back they busted 2007 Topps Sterling Baseball and pulled a Joe Dimaggio Cut Auto. Leave some hits for the collectors!!!! UD Black Basketball was recently released and despite my bad experience with UD Black Baseball, I think its a really nice set. There are a couple of dual autos in the set that I thought were interesting because they feature a rookie paired with a non-basketball player. Here’s Kevin Durant and Vince Young, two guys from the University of Texas. And Mr. Cub, Ernie Banks and Acie Law IV. Banks is the great-uncle of Law. Being an A-Rod fan I thought this was an awesome card and I was interested in bidding but the price was just too high.